For a limited time only, board covers are back! So you went out and got yourself a new carbon fiber board, or you just got a new board with a custom graphic, or maybe you just took an old board and got a spendy little paint job on it. You're gonna want to cover that baby up when you're not using it to preserve the beauty of that board, and Sky Ski has just the cover to do it. 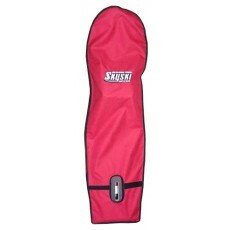 The Sky Ski board bag is made with the same heavy duty nylon the foil cover is made with. Black/padded on the bottom, red and not padded on the top with the Sky Ski logo you've come to know & love in the tip.